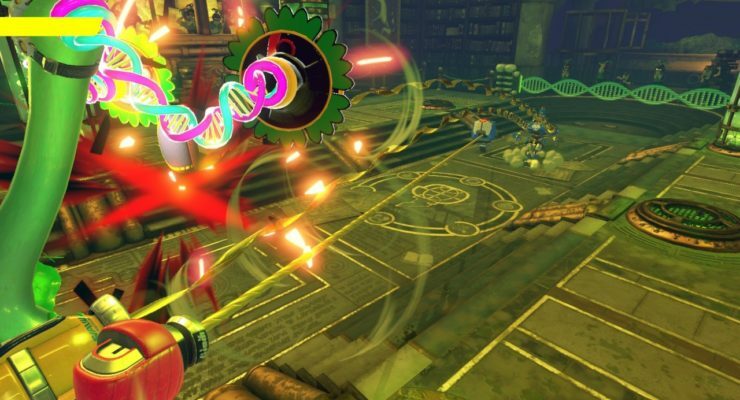 This is the final part in Pure Nintendo’s ARMS preview coverage. Be sure to check out parts one, two, three, and four if the character you’re interested in wasn’t discussed here. For now though, let’s continue with the finale of our ARMS preview, where we will be talking about Mechanica and Byte & Barq. 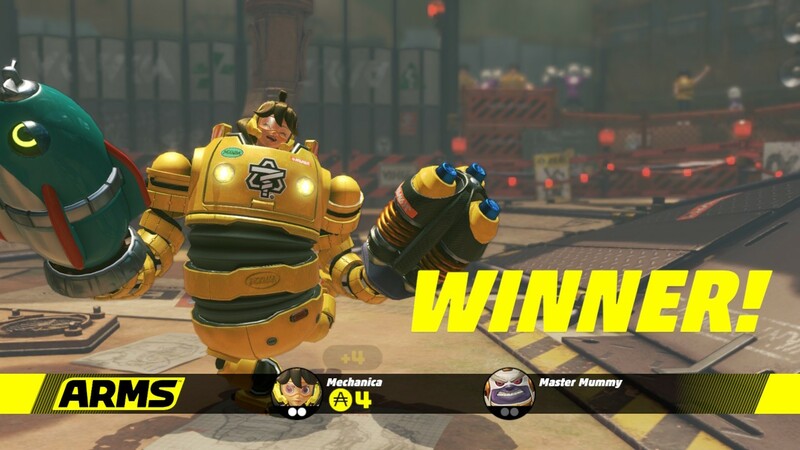 With no ARMS of her own, Mechanica resorted to building a fighting suit to take on the competition. Much like Master Mummy, Mechanica is a slow, heavy-hitting character that does well by putting pressure on her enemies with a barrage of attacks. 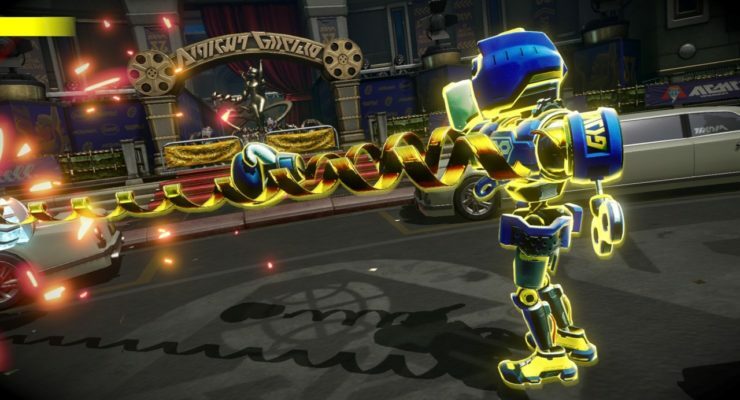 Unique to Mechanica, however, is the jet-pac built in to her suit. By holding down the jump button, you’ll be able to hover in the air for a short time, giving you an edge by taking the higher ground. Holding down the dash button will let you glide across the arena, giving you a brief period of great mobility. 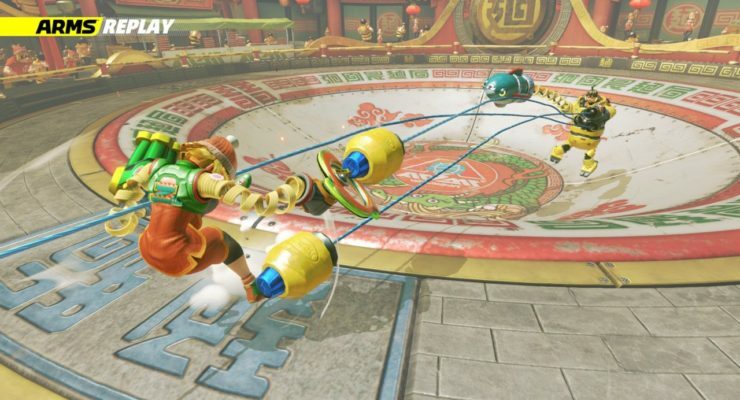 Of course the dash and the jumps can be used to dodge effectively, but mastering the hover and glide functions of Mechanica’s suit can make you a speedy threat that can deal massive damage. 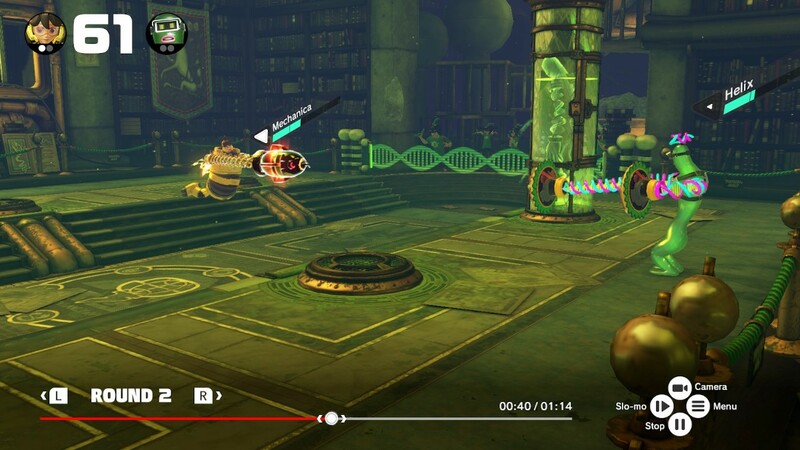 Mechanica’s stage is the junkyard, where keeping the high ground is ideal. 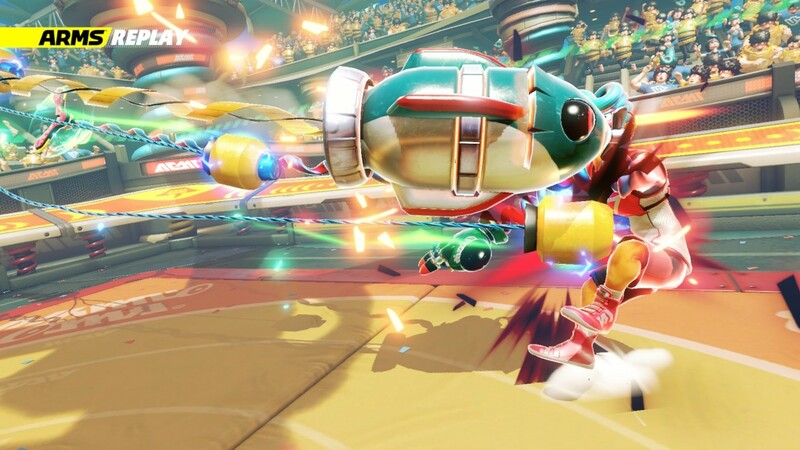 The Homie ARM attachment locks on to your foe. 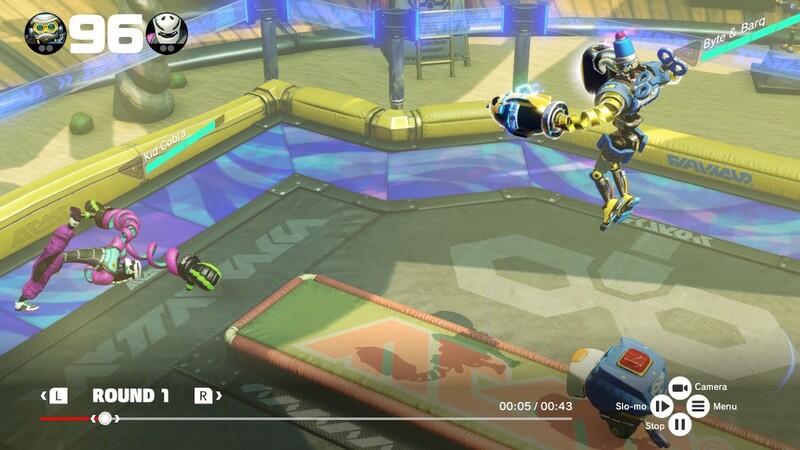 Surprisingly, Mechanica can get quite airborne. The gliding option lets you move in any direction quickly. Keep the pressure on to overwhelm your enemies. Mechanica has the spirit and determination to win. 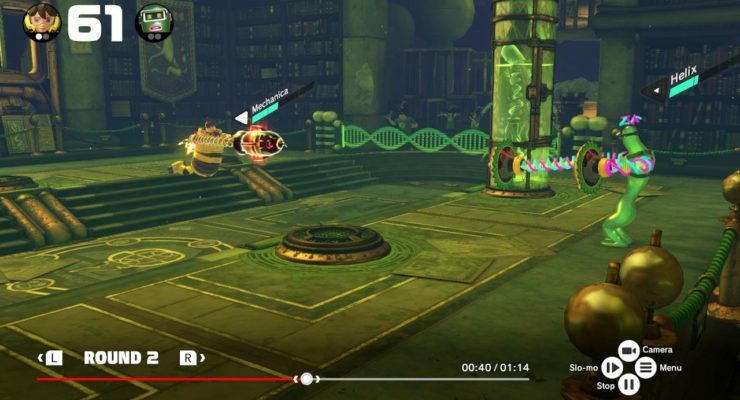 The junkyard stage is where Mechanica calls home, and besides having the two junk pillars in the center to keep you covered, holding the higher ground will give you the advantage. 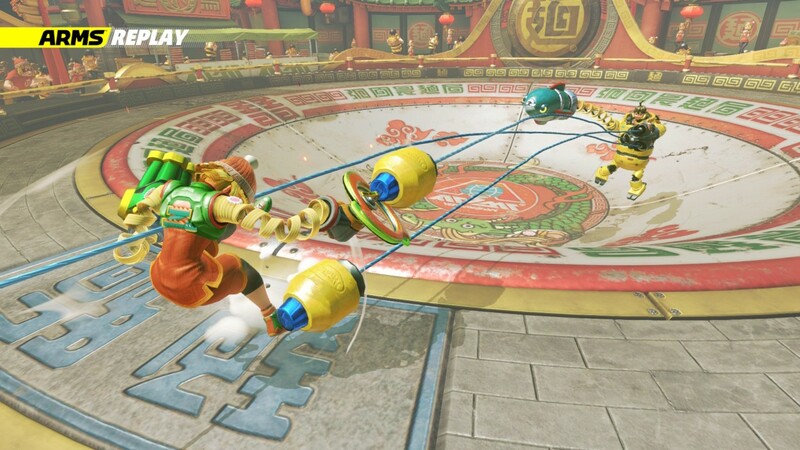 I found Mechanica pretty easy to pick up and play, possibly because her ARMS attachments have a wide hit radius and homing capabilities. 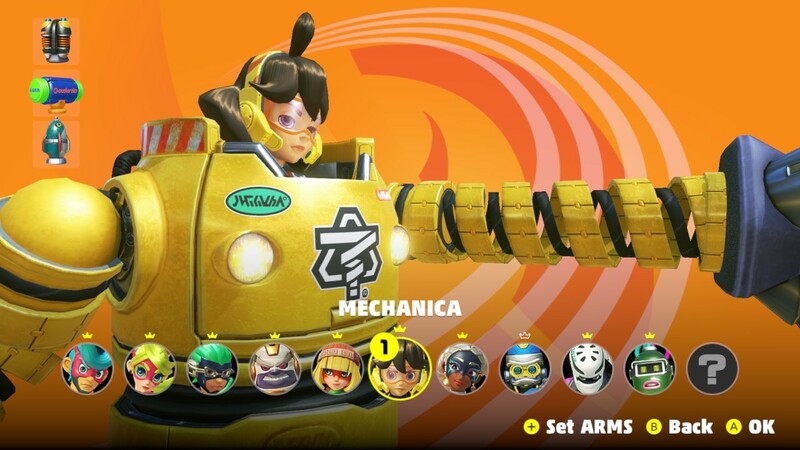 If you enjoy dealing lots of damage but don’t want to compromise on speed, Mechanica is your go to gal. No one escapes the long ARMS of the law. 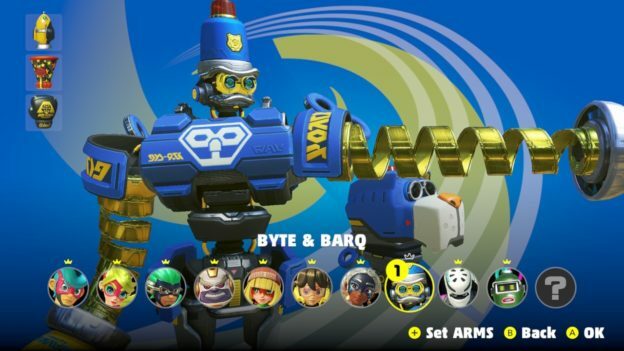 For a robot police officer, Byte and his pal, Barq have a pretty fun personality. Working in tandem, Barq occasionally assists you by launching punches at your opponent, or even serving as a step stool so you can get some extra height during a match. 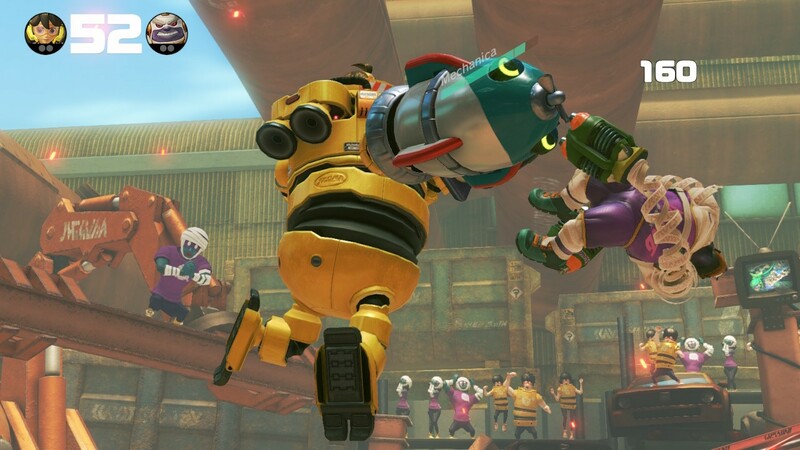 When their special attack is ready, Byte & Barq join together to bring the pain to any ne’er do wells. 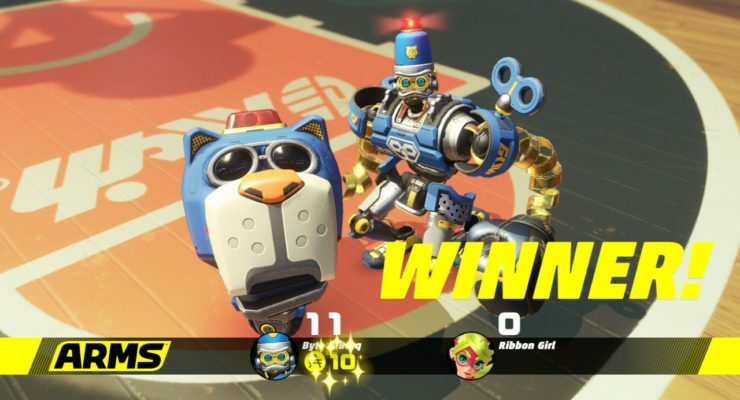 While Byte tends to be pretty serious, (he is a robocop afterall) Barq manages to be adorable despite being made of metal. Byte & Barq’s stage harolds back to their beach cop days. 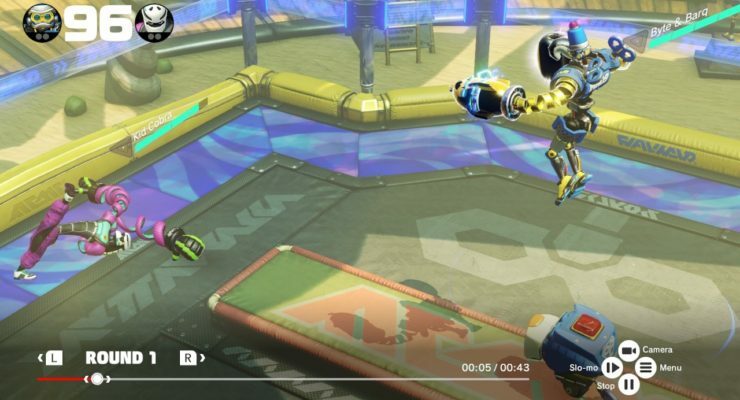 Using Barq can give you some nice height. 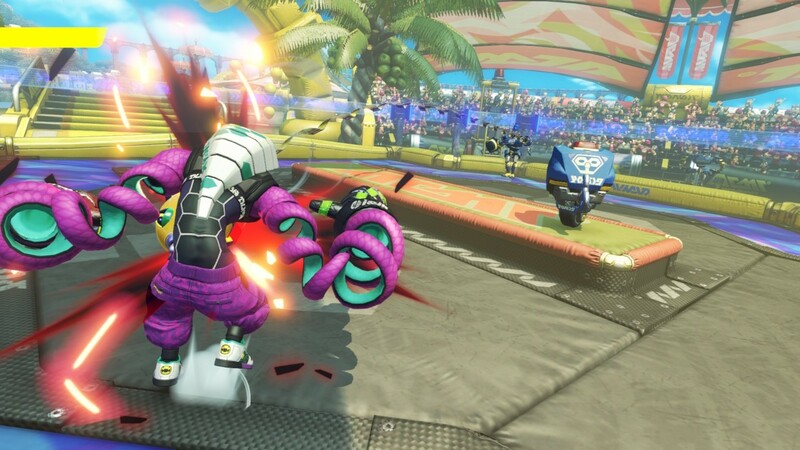 It is rare, but Barq does hit his target occasionally. Lay down the law as Byte & Barq! 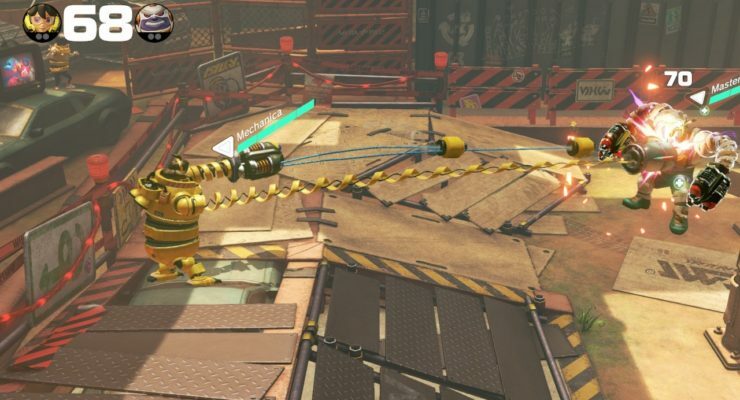 Byte & Barq’s stage is fairly simple, with a small raised platform serving as a way to keep yourself distanced from your opponent, but you can easily clear this with the help of Barq. Barq himself may hit his mark from time to time, but you should count on him to help keep pressure on your target rather than actually dealing damage. I do enjoy the design of these characters, but I couldn’t help feeling slightly underwhelmed using them due to the random nature of Barq. 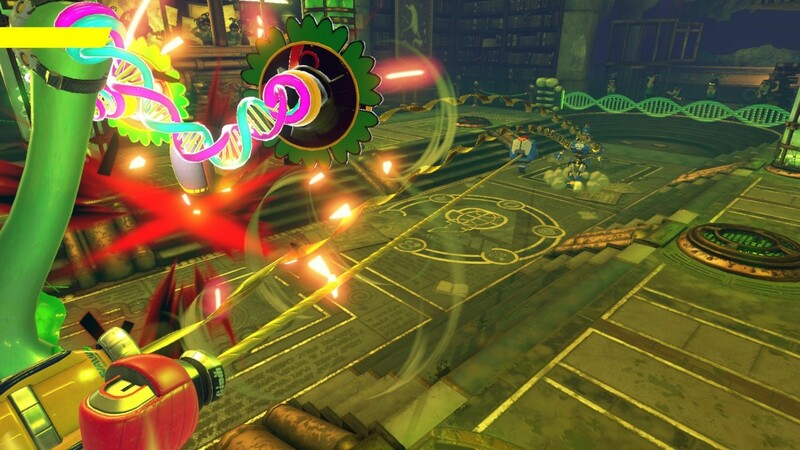 While they are not difficult to play as, if you want to try something a little different, give Byte & Barq a try. And with that, we have finally gone over all of my thoughts on each of the fighters of ARMS. Some were easier for me to pick up than others, but each character had a unique method of play that I really enjoyed figuring out. 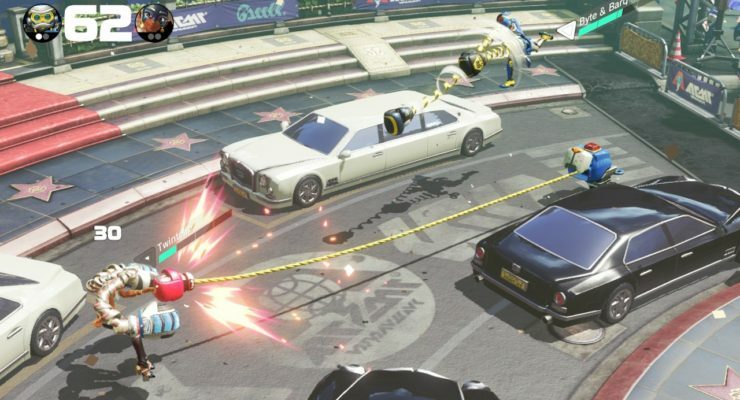 With ARMS releasing on June 16th, it won’t be long until the world can get their hands on this game and start giving the combatants a shot for themselves. 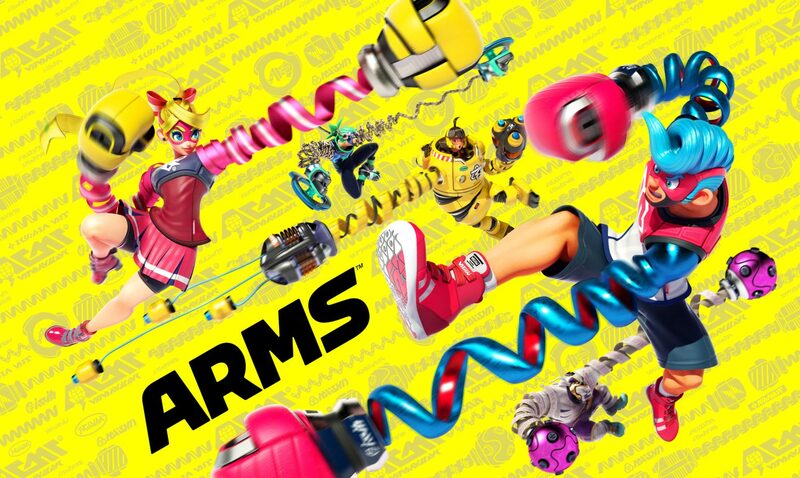 Don’t forget to keep an eye on the website for our full review of ARMS, and as always, be sure to comment your thoughts on the game below. For now, this is Alex, signing off!